hiring methods you’re using today. organization and drain your profits! You’ve heard the old saying that a chain is only as strong as its weakest link. It’s a great metaphor for all kinds of situations, and a perfect one for your business. You are only going to be as productive, effective, and successful as your LEAST productive, effective, and successful team member. If you’ve ever seen any aspect of your business suffer because of the inadequate performance of a particular person, you now just how true that is. A bad hire can wreak havoc in a company, and cause a chain reaction of negative consequences — missed deadlines, inefficiency, lowered morale, resentment — that goes all the way to your bottom line. And once an employee is hired, it can be very difficult (not to mention costly) to get rid of him or her. —then your organization runs like a well-oiled machine, with each part working efficiently and effectively to deliver excellent results. That means, of course, that it is absolutely CRITICAL that you bring in the best possible candidate for every job right from the start. The problem is, the typical processes and methods used to recruit and hire people — processes you’ve more than likely been relying on up until now — really AREN’T designed to effectively accomplish that goal. Staring with the ads and recruitment strategies that attract candidates, right on through the interviewing and assessment stages, down to the presentation of an offer, standard hiring practices leave a huge amount of room for error. But there is a way to avoid those errors. An easily-implemented system that virtually eliminates the “wild cards” and guesswork in the hiring process, and enables you to hire superior people with near-scientific consistency and accuracy. By way of telling you about this system, let me introduce myself. 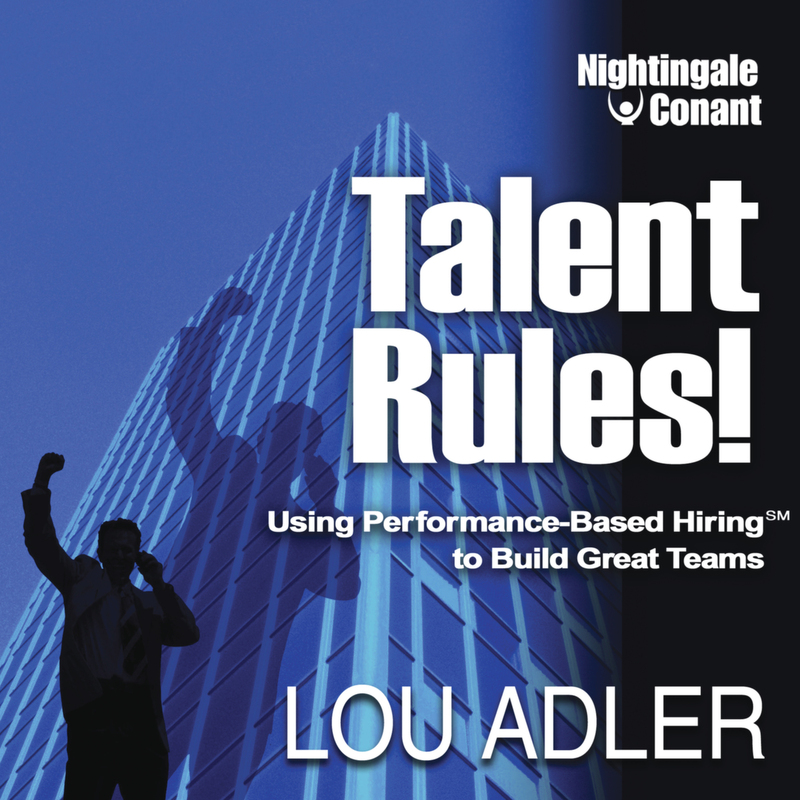 My name is Lou Adler, and I’ve spent my entire career studying the recruiting and hiring process, from both inside companies as a manager, and outside of them as a headhunter. I found out a long time ago that hiring the right person for every job is absolutely vital to the success of an individual manager, and of an organization as a whole... and that standard practices far from ensure that this happens. But it wasn’t until I put myself on the line as a contingency recruiter, offering my clients a one-year guarantee on the candidates I found for them, that I decided to do something about it. Most recruiters at the time offered a 60- or maybe a 90-day guarantee on their candidates. Giving people one whole year gave me a huge competitive advantage over just about everyone else. On the other hand, if the hire didn’t work out, I didn’t get paid. And a year gave employers an awfully long time to observe an employee and assess whether he or she was indeed “working out”. As you can imagine, I became highly motivated to find ways to improve upon the existing hiring model and eliminate the maybes in the process. My job quite literally depended on it. Five years later, I had a system in place that was consistently producing measurably better hiring outcomes. My clients were thrilled, and I knew that while my new system was far from perfect, I was definitely on to something. I’ve been strengthening and refining that system ever since, and I don’t have any plans to stop working to make it better. But today, more than fifteen years and countless improvements, tweaks, and fine-tunings later, I can confidently say that the methodology I have created is as close to guaranteed as you’re going to find anywhere. — with an overall reported hiring effectiveness of more than 95%! My system works for all of them because it’s all about hiring ONE GREAT PERSON for the job at hand. So whether you’ve got one position to fill, or hundreds — a three-person team in your garage office, or outposts all over the world — the exact same hiring principles apply. If you’ve gotten this far, then I suspect that you are directly involved in one way or another with your company’s hiring decisions. If that’s the case, then I’d like to offer you a RISK-FREE opportunity to put the latest, greatest, most up-to-date version of my PROVEN hiring system to the test. It’s called Talent Rules: Using Performance-Based Hiring to Build Great Teams. And it is going to completely transform how you hire, who you hire, and how those hires impact your organization’s productivity and profitability. Poor candidates are so often hired because standard hiring practices suffer from a multitude of flaws, from the way most job descriptions are written, to who is involved with the interviewing process and what criteria candidates are judged on, and more. The system you’ll discover in Talent Rules — what I call the POWER Hiring methodology — is based on five fundamental principles that reflect the key steps involved in getting hiring RIGHT. Every technique, tip, and strategy you’ll learn in Talent Rules stems from one of these five principles. Together, they create a unified, streamlined, and virtually airtight hiring approach to hiring that all-but-eliminates the possibility of hiring the wrong person. And so much more! In Talent Rules I guide you step by step through the entire hiring and recruiting process, covering every conceivable piece of ground along the way. Once you have it, you will possess a COMPREHENSIVE and PROVEN system for attracting and hiring superior people. I’ve designed Talent Rules to be totally practical and hands-on. So in addition to six idea- and information-packed audio sessions, you’ll also get printable forms and checklists and “hiring hot tips” cards for quick reference. They’ll make it incredibly easy for you to take what you learn no the sessions and start putting it into practice immediately. And you can utilize them over and over again, each and every time you launch a new search. Your business is only going to be as good as your weakest employee. So take a minute right now to imagine just how strong... how productive... how completely unstoppable your business would be if every single person who worked there was the very best person for the job. If every single piece of your operation were functioning at its highest possible level. Now stop imagining it, and start making it happen! Superior employees equal a superior business. Find them. Hire them. Fill your organization with them. When you do, you will be on your way to greater success — not to mention an easier, more enjoyable work life — than you ever imagined. I want to find out how to hire the best person for the job every time, so that I can build a strong, cohesive, highly-effective team that will make my business hugely successful. Talent Rules! for the special price below.